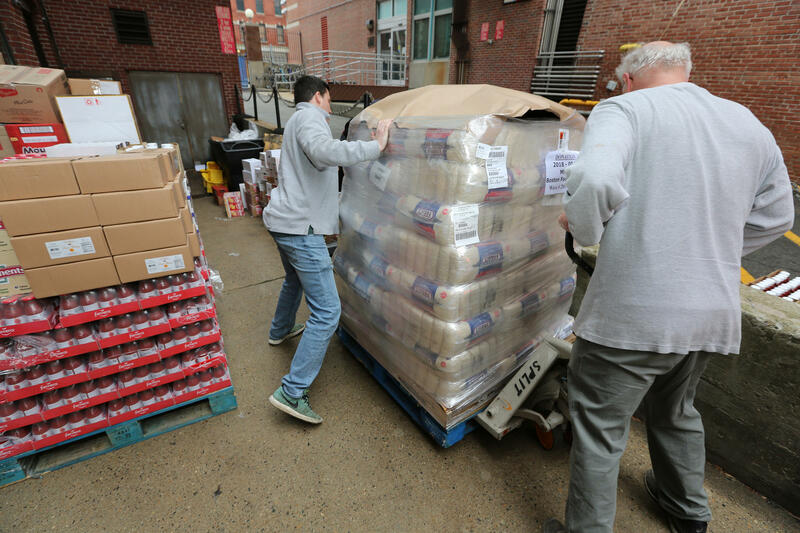 People gather items for a pop-up food pantry opened in Boston for men and women of the Coast Guard, the only branch of the armed services working without pay. Coasties, as they're called, who usually rush to rescue others in peril, stepped up to help their own, forming a bucket brigade to ferry 30,000 pounds of groceries off trucks and onto shelves in the corner of a cafeteria. They stocked everything from milk to medicine, and cereal to celery, all free for the taking. Don Cox, president of the Massachusetts Military Support Foundation, which is running the pantry, says nearly 400 families stopped in to help themselves to food in the first two days it was open. The pantry, called the Empowerment Center, is supported by local businesses and foundations including Ocean State Job Lot, the Patriots foundation, the Greater Boston Food Bank as well as by individual contributions to GoFundMe page set up by the Massachusetts Military Support Foundation. Cox says an existing pantry for military families on Cape Cod is handing out more in two days than it usually does in a month. "We've been hit hard with the baby food, the diapers. I mean it's just a tidal wave," he says during a break, then turns to one of his donor partners. "That reminds me, I'm out of diapers again." Jenny James, wife of a coast guardsman and mother of two, was among those who came in to "shop" this week. She says she was shocked when she first saw how much was available. "Honestly, I was really blown away," she says. "It's actually very relieving." With so much in limbo right now, she says, she's basically stopped buying anything she doesn't absolutely have to. The pantry allows her to save her limited cash for other essentials. "It's very comforting to know a little weight lifted off of me having to worry about putting food on the table," she says. "Especially when you don't know what the future holds." It's more comforting than the advice recently posted on a Coast Guard employee-assistance website that rather tersely implored those furloughed not to "hide your head in the sand" and to find creative ways to earn supplemental income. For example, the tip sheet suggested cleaning out the attic, basement and closets and having a garage sale. Or selling items online. Other ideas included babysitting and dog walking for cash. Wednesday night, the Coast Guard pulled the document offline, saying it "doesn't reflect ... current efforts to support its workforce during the lapse" in federal funding. Cox calls it shameful that guardsmen and women have to worry about where their next meal is coming from. "It's just a horrible thing that we have done to these people," he says. "They have families and responsibilities ... and they've been left out there on a ledge. We put them in uniform and we teach them to be proud, and then we put them in a situation like this and it's just criminal. ... I mean this thing just balloons and spirals out of control." "It's just gonna get worse"
Other federal employees can relate. Rita Silva Martins, 34, from Natick, Mass., thought she'd finally made it. After years of janitorial work, she landed an airport security job with the Transportation Security Administration making $36,000 and benefits. She and her husband, who works 60 hours a week moving cars for a car dealer, had just moved into their first house with their four kids and were managing to just scrape by. That is, until the shutdown put everything at risk. "It's weighing [on me] heavily," she says. "I'm having panic attacks, not knowing what's going to happen." Rita Silva Martins and her 9-year-old daughter, Zaila, at home on a day off. 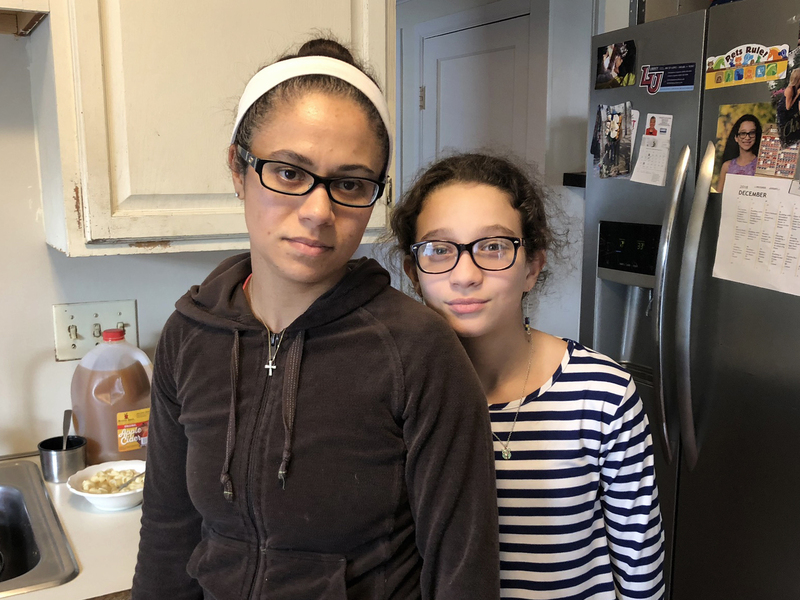 Martins is working overtime, but worries she won't see a paycheck in time to pay her mortgage or day care bills, so she can keep her house and her job. Martins is still working, actually adding overtime hours, hoping she will eventually see the back pay. But if and when a paycheck comes, Martins worries, it would be too late for her next mortgage payment. In order to keep working, she also needs to pay for preschool, and to put gas in the car for the long commute to the airport. On top of it all, she just found out her dog needs surgery that's going to cost more than $1,500. And she has no real savings to speak of. "It's just gonna get worse," she says. "I have no jewelry to pawn, nothing to just cash in. It's devastating." Martins is looking for a second job; her husband already took one, desperately trying to hold on to their house. Martins fights back tears at the prospect of having to sell. "It's like your dream going away," she says. "I don't know when I'm going to be able to buy something else. How can I save If I'm living paycheck-to-paycheck right now?" Another TSA security officer, Tom Dasher, is equally worried. He doesn't have his wife's salary to fall back on, because she's also working for the TSA without pay. "It weighs on you," he says. "You can see it in everyone's faces. It is hard. And it's going to get tougher." To make ends meet, Dasher's using gift cards he got for Christmas. Then he'll tap into savings. But even that won't last long, with a 2-year-old in day care and a medical condition that routinely leaves him with big, unexpected doctors' bills. "It will eventually get ugly," Dasher says. "The math will break down." Their only option then, Dasher says, will be asking relatives for a loan. "It is very tough to even think about asking for any kind of handout," he sighs. "But it comes down to sucking up your pride and taking care of your family." Rep. Lori Trahan (left), D-Mass., meets with furloughed EPA employees seeking help at her district office in Lowell. Even late-career higher earners are feeling the pain. Steve Calder has been working for the EPA as an environmental scientist for more than 25 years and is president of the American Federation of Government Employees Local 3428. 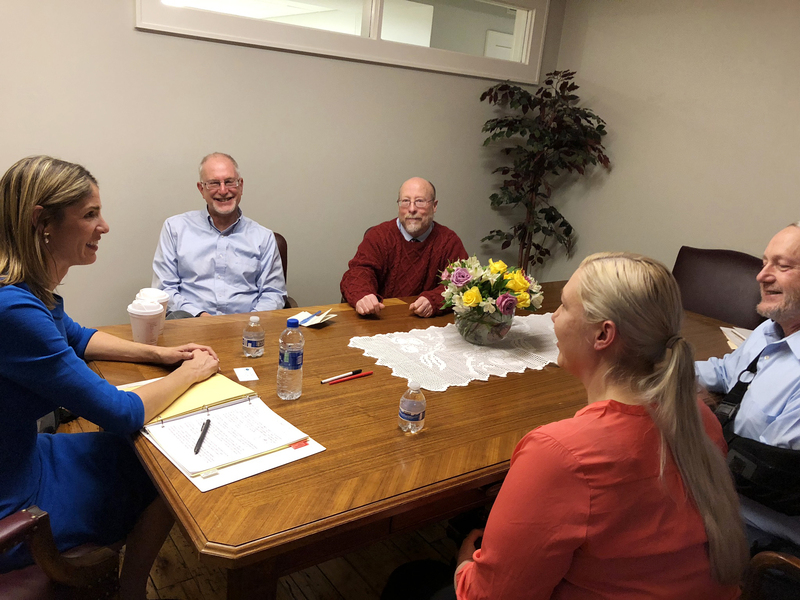 He was one of several EPA employees who met with Rep. Lori Trahan, D-Mass., this week at her Lowell office to explain their predicament and ask for help. Some are worried about meeting kids' college tuition deadlines, or their mortgages. But it's not just cash flow that's a problem, Calder tells Trahan. He recently borrowed against his retirement fund, and his loan payments come out of his paychecks. But if he doesn't get paychecks, he says, he could face a series of costly consequences. "If the loan becomes in default, it becomes income by IRS rules," he explains. "And then there's also a 10 percent penalty associated with taking it out because it was part of a retirement fund, and so that's money that I would never see again." Trahan nods and scribbles notes. It's her very first constituent meeting since she was elected, and she tells them she's learned a lot that she'll take back to Washington. The loan dilemma alone, she says, was "a lightbulb." She promises to help however possible, legislatively or individually. "If there are people who are falling on hardship, please have them call our office," she says. "Certainly there are things that we can do to be helpful to kind of ward off the collectors. We'd like to do that. This is not your burden alone and we want to be helpful." Trahan calls it "sinful" that people are being asked to work for no pay. And while President Trump says he can relate to the hardship workers are enduring, after listening to the furloughed workers' stories, Trahan retorts, "Anybody that can relate, wouldn't let this happen."